I have GIS data in EPSG:4326 consisting of 2D points, linestrings and polygons that are all close (i.e. less then a couple of hundred of meters) to a certain WGS84 coordinate point. I would like to convert/reproject the geometry from a WGS84 to a 2D system in which the coordinates are north/south and east/west distance from the reference point in meters. In other words, the reference point should become the origin of a new euclidic SRS and the axis unit should be meters. How I would I do that in QGIS? I assumed I would be able to generate a custom SRS with my reference point as a center but I have no idea how to express this in QGIS. Was I right to assume that I would need to dig into PROJ.4 expressions for that? Or should I some other tool? I have the whole osgeo4w toolbox at my disposal. You can use proj.4 (which is working in the background for qgis), the transverse mercator projection and set the origin to your reference point (..here latitude 52 degree and longitude 11 degree). 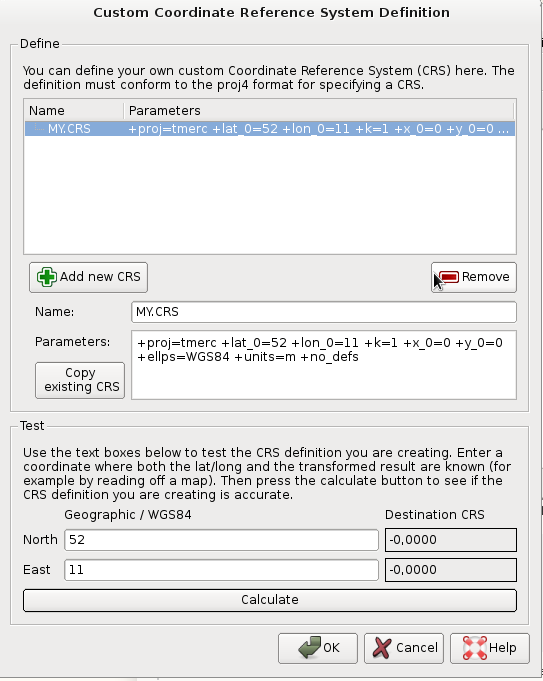 If you define a new coordinate system via the menu settings -> custom crs and apply an adapted proj.4 string for your task (modify the longitude and latitude), you can use it in qgis. Replace <LAT> and <LON> with the coordinates of your reference point. Click OK. You should now be able to set this as the project CRS by going to Project -> Project Properties... -> CRS and scrolling all the way down in the CRS list to find your new CRS under User Defined Coordinate Systems. The laea in the Proj4 string is the cartographic projection, Lambert's Azimutal Equal Area, in this case. You can find a list of common projections and their usage over at the GeoTIFF site. You can try using "Custom CRS" under settings menu. For example you can use as a base for your custom CRS, WGS84/UTM zone 21N (choose the correct zone); press "Copy existing CRS" and select the system you want to copy. How can I find an OSGB six-digit code's bounding box? Representing uneven tree canopy spread around point in QGIS?